In Boulder, as well as throughout Colorado, more people are choosing to ride motorcycles as their daily mode of transportation. Though motorcycles have their benefits, they also can be dangerous. Because of the limited protection a motorcyclist has in the event of a crash, individuals can sustain devastating injuries that take months or even years to heal. At Zinda Law Group, our Boulder motorcycle accident attorneys have helped thousands of crash victims get their lives back on track after an accident. We have the knowledge and resources necessary to help you pursue maximum compensation for all the ways your injuries have cost you, and as one of our clients, you will pay nothing unless we win your case. If you or a loved one has been injured in a motorcycle accident, call Zinda Law Group at (800) 863-5312 for a 100% free consultation with our motorcycle accident attorneys in Boulder. How Can a Motorcycle Accident Lawyer Help? Many drivers fail to share the road with motorcycle riders, and unfortunately, the motorcyclists often bear the brunt of these actions. 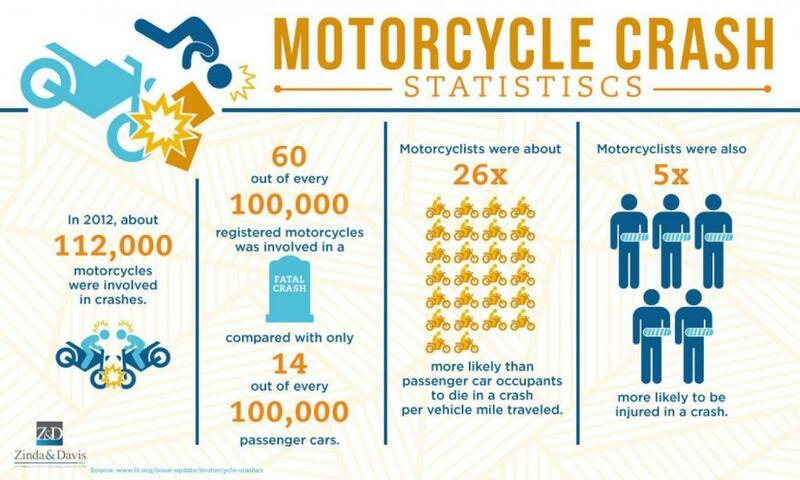 According to the Insurance Information Institute, motorcycle riders are up to 27 times more likely to be killed in an accident than individuals in passenger cars. Any driver on the roadway is required to act as a reasonably prudent person. When a motorcycle accident takes place, your attorney will be attempting to prove that the other party was not acting reasonably and, as a result, was negligent. The Boulder motorcycle accident lawyers at Zinda Law Group can help you prove that another party failed to act reasonably and that the other party’s negligence caused your injuries. You will quickly learn that many motorcycle accident cases do not go to trial. The insurance companies and opposing parties will often attempt to settle in order to save on the cost of litigation. Settlements are often beneficial to the injured party, as they tend to occur much earlier in the legal process. However, it is important to consult with an experienced Boulder motorcycle accident attorney in order to properly evaluate a settlement offer. Our attorneys will be able to come up with a proper valuation, which takes into account the likelihood that you will win and how much you may be entitled to from a jury. At Zinda Law Group, our Boulder motorcycle wreck attorneys can help you build the strongest case possible and seek maximum recovery for medical bills, lost income, property damage, pain and suffering, and more. Our firm also believes a motorcycle accident victim should never have to worry about their ability to afford superior legal representation. That is why we offer 100% free consultations, and why you will pay nothing unless we secure a favorable settlement, judgment, or verdict for your motorcycle accident case. That’s our No Fee Guarantee. If you or a loved one has been injured in a motorcycle accident, call Zinda Law Group today at (800) 863-5312 to receive your free consultation with our motorcycle crash lawyers in Boulder, Colorado.